It’s the Company’s biggest product quality innovation and it’s set to drastically improve product consistency and deliver customers pizza as it should be. Domino’s Group CEO and Managing Director Don Meij said, “As a Company we always work to improve, looking to see where and how we can do better. This focus constantly drives us to deliver and this is what Pizza Checker is all about. “From our freshly sourced, premium quality ingredients to our transparent and interactive GPS Driver Tracker technology, we work hard to take the time to care for every stage of the pizza ordering experience. But when we get busy, some of our orders haven't lived up to our high standards or the quality our customers deserve and have come to expect from us. “That’s why we have partnered with Dragontail Systems Limited to deliver an innovative technology solution to ensure pizzas meet Domino’s high standards at all times, even when we are extremely busy! “Pizza Checker will dramatically improve the quality and consistency of handmade pizzas - cooked and cut to perfection, correctly topped with only the highest quality, freshest ingredients consistently,” Mr Meij said. The next leap forward in the Domino’s DRU Artificial Intelligence journey, Pizza Checker means DRU has made it’s way into our stores and gives customers more visibility over their order by instantly checking the quality of every pizza made. The new cut bench quality camera unit is an electronic eye that sits above the cut bench and photographs pizzas to check them for quality control. It identifies pizza type, correct toppings, topping distribution, crust type (base) and temperature and reports back in a couple of seconds. “It’s great to see part of the DRU family make its way into our store to help our team members–almost like a virtual trainer helping all of our team members make better pizzas for our customers,” Mr Meij said. The transparent technology also provides customers with an image of their pizza on the cut bench, which will appear in real time on the Pizza Tracker page of the customer’s order. As part of this process they are notified if their pizza has failed the strong quality testing, resulting in a remake. “It’s all part of our ‘We Care’ focus and our 100% customer satisfaction guarantee. If you’re not happy with the way your meal’s been prepared we will happily replace or refund your order. It is hoped Pizza Checker helps give customers increased satisfaction and the reassurance their order is in safe hands. “The end result is an improvement in the accuracy of pizza orders as it guides the cook process through perfectly and holds us accountable to the high standards we expect to go out the doors and that our customers deserve. “We are forever on a journey of improvement and this break-through technology will go a long way in helping us on that journey and the commitment to do better for our customers. “We look forward to rolling this technology solution into all of our stores and we can’t wait for our customers to put us to the ultimate test,” Mr Meij said. 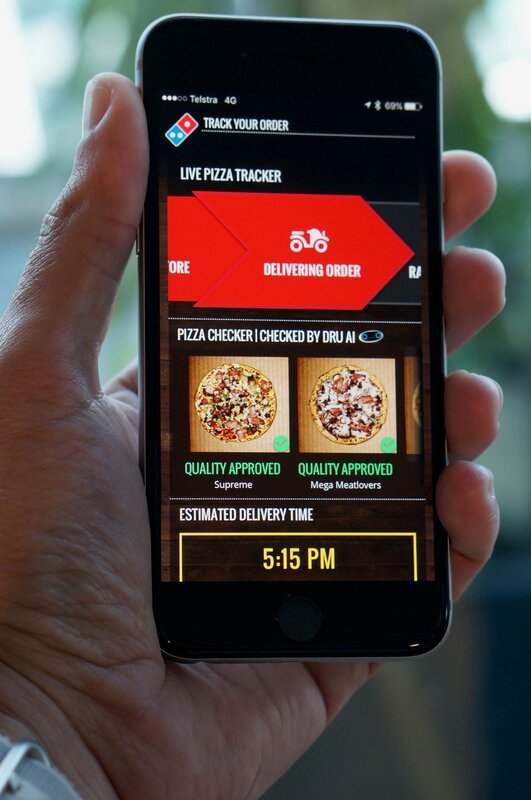 Domino’s Pizza Checker will be implemented into all Domino’s stores across Australia from next year. With a 12 month Global exclusivity agreement in place, The Company will also look to roll this technology out across other markets.